Windy Field Farms: Spring Means....Farmers' Markets! Well, spring is officially here in Dufferin County - robins, killdeer, sparrows and grackles are very vocal around the farm. In the gardens, my fall-planted garlic is poking up, the fat drumstick primulas are blooming in my bog garden, and all the spring showgirls have arrived: tulips, chinodoxia, scillas, grape hyacinths and daffodils, to name a few. By the way, the good looking farmer at the left side is my husband, Ralph! The warmer weather means it is easier to keep the mushroom barns at the right temperature, and somehow, even though they're kept inside, the mushrooms know it's spring, too. It's that wonderful time after heating season and before cooling season! 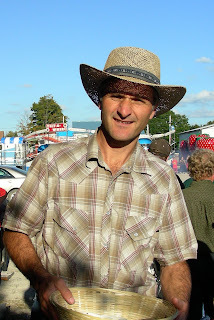 For the last two summers, I have been taking our mushrooms to a local farmer's market, in nearby Inglewood, Ontario. We had an advisory committee meeting this afternoon, so that we could discuss ideas for how to improve the market, and get more people to buy delicious locally produced food. Hopefully, within a few weeks, I will be able to provide a link for the market on this blog, so you can check it out for yourself. In the meanwhile, I'm going to get on my soapbox and explain what I love about the Farmer's Market. First of all, from my point of view, it's an opportunity to show off our beautiful mushrooms. Many people have never seen mushrooms the same day they are picked - often they are several days (or up to a week) old when they are purchased in stores. Fresh mushrooms not only look better, their taste is amazing! And the aroma! Once I've "wowed" people with the mushrooms, I can answer questions about how we grow them, give them ideas for menus and recipes, and explain our farming lifestyle. From a customer's perspective, in most cases, they are meeting the people who grew the food they are going to be taking home and eating. Putting a face to the person who took the time and expertise to grow your food somehow adds a truly personal touch to the meal you will be eating, a connection to the source of your nourishment. As I said earlier, any questions (and often misconceptions) can be dealt with directly with the people who will have the answers. Buying local also means that your food will be fresher, often less expensive (because of lower transportation costs and overhead) and you will be able to learn everything about how it was raised or produced from the farmer. Obviously, eating locally helps support your local economy, but in my opinion, the best thing about it is the quality of the food you will find at the market. Food that has just been harvested or prepared will never taste any better. Of course, you will also learn that in a cool, wet spring, it will be hard to find sweet strawberries....and that a hailstorm can turn bushels of Grade A apples into marked "seconds" (which will still be great for applesauce and pies). You will develop an appreciation of the trials and tribulations of the farmers you are supporting. So the next time you see a sign or ad for a farmer's market, by all means go and buy some of the finest produce and farm products you will ever see, but also take the time to talk to the people on the other side of the table...you never know what you'll learn! As we said in our own local Community Harvest here in Grand Valley, don't forget to "Shake the Hand That Feeds You!" Wendy started us down the local food path a few years ago. I would hazard to say that almost all of our food is local except things like sugar and spices. We are regulars at the local farmer's market and many of the vendors know my wife and girls by sight, if not name. May your season be long and pleasant.